Its been surmised that if a loudspeaker sounds bad at a trade show, you shouldnt jump to conclusions. The culprit may be any number of factors: poor room acoustics, inadequate partnering electronics, poorly recorded source material, etc. But if a speaker sounds good at a trade show, you can rest assured that it has potential. This reasoning seems pretty sound to me -- a bad speaker cant readily be made to sound like a good one, but a good one can easily be made to sound like a dud. This was the overriding reason I pursued the Ascendo System M-S ($45,000 USD per pair) for review in "The Worlds Best Audio System": Id heard Ascendos speakers year after year at Germanys High End show, and theyd never failed to impress. Whenever Ive encountered Jürgen Scheuring, Ascendos designer and always-affable frontman, hes been more than willing to discuss his products and play whatever music show attendees want to listen to. Hes confident that his speakers will sound good regardless of the musical genre, and hes open to explaining the engineering behind that sound. You can get a taste of the companys technical side by reading "Searching for the Extreme: Jürgen Scheuring of Ascendo." But the sound is the key, right? I set out to get to know the System M-S -- the top of the Ascendo line, the flagship, the big dog -- a speaker system packed with interesting technology and the promise of an unusually high level of performance. When the System M-S arrived, Id planned to set them up in short order and get to playing some music. When I was told by the delivery driver that the systems shipping weight was over 900 pounds and that it was packaged in five large flight cases, I rethought that plan. As it turned out, the systems modularity made it much easier to unpack than I would have guessed: the two bass cabinets each had their own case, and the same with the two stands; the two manageably sized upper modules were packed in a single container. This modularity is intended not only for convenience of shipping and setup, but for sound as well: the modules are more completely decoupled from each other and the floor -- form follows function. In no time at all, I had the System M-S components upstairs in my Music Vault listening room, awaiting assembly. If you like large, gloss-black squares and rectangles coupled to beefy chrome stands, youll love the look of the Ascendo System M-S. If thats not your cup of tea, a white finish is available; from the photos Ive seen, it softens the look a tad -- just a tad. 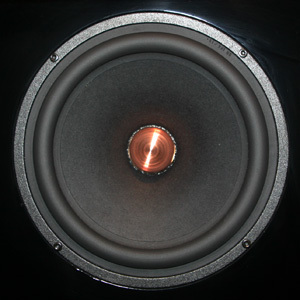 Each assembled speaker is rather large at 61"H x 19.7"W x 25.5"D, and hefty at 265 pounds. The cabinet feels solid when rapped, if not completely inert -- its constructed of a sandwich of MDF and bitumen and is very nicely finished. The M-S is a three-way design with a claimed sensitivity of 91dB/W/m and an impedance of 8 ohms. The bass cabinets actually contain the woofers and the midrange drivers. The 11" Eton Hexacone woofer is mounted internally -- completely out of sight -- and fires to the exterior via a large-diameter front port. Ascendo calls this sort of bass loading semisymmetric bandpass, and claims that "The technical results are loudspeakers with ideal impulse response and extreme headroom." Above the port is an 8" SEAS Excel midrange cone that seems to handle a fair amount of the midbass. It has a protruding copper-colored phase plug and is attached to the cabinet with machine screws. The rectangular top module houses a RT2H-A Kapton-film ribbon tweeter, sourced from HiVi. 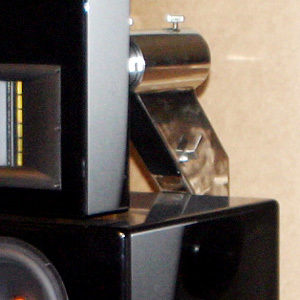 The System M-S is purported to be time-aligned, and adjustment of the top module in relation to the bass bin, via the large chrome stand, is a snap. Essentially, you plug your listening height (ear level) and listening distance from the speakers into the supplied chart, then slide the top module to the prescribed numeric position marked on the stand. The bass bin is mounted on the T-shaped base of the stand via a three-point mounting system: the cabinet rests on two footers up front, and hangs via a ball-and-socket system on the upper rear. The steel stand continues up past the bass bins, then angles toward the front of the speaker. The angled section terminates in a hollow fitting that receives a large-diameter steel tube thats an integral part of the top module. It all goes together fairly easy, though its not easy to then move the assembled 265-pound speaker. There are no facilities for grilles with the Ascendo System M-S, which might make the look a hard sell to significant others. Youll need jumpers to connect the M-Ss three sets of Furutech binding posts, or youll want to triwire -- which is what I did with a single stereo amplifier (you can also biamp or triamp). 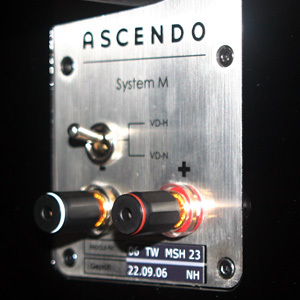 The Ascendo has two impedance adjustments, one per module, to help tailor the system to your amplifiers damping factor and load-driving characteristics. I toed the speakers in so that they were aimed almost directly at my listening position. The Ascendo System M-S is the second ribbon-based speaker system to occupy the Music Vault in the past year. The first was the Sound Fusion Luna, which I found to have an "open, peppy top end that lets you know youre listening to an uncommon driver." I enjoyed the Luna greatly -- I gave it a Select Component award -- but my perspective on its tweeter has since changed a bit. Whereas the Luna seemed to revel in its tweeters extension -- as did I during the review period -- Im not sure Id have reveled over the long term. Looking back, I think it might have been too much of a good thing -- too obviously extended. The System M-S helped solidify this impression with the performance of its own ribbon tweeter, which didnt sound like the Lunas at all. On the contrary -- the sound of the Ascendo ribbon was more fluid, more integrated, more pleasurable. It still had excellent extension, but it wasnt one of those of which youd say, Wow, listen to that tweeter! Its better than that. As I write this Im listening to the Indigo Girls eponymous release from 1989 [CD, Epic EK 45044]. "Closer to Fine," the most successful single from that album, and "Secure Yourself," my favorite track, both feature a prominent acoustic guitar. This type of music let the Ascendos tweeter shine by displaying good speed and resolution of fine detail, but without any of the spotlighting of specific frequencies that would earmark a lesser design. The ribbons output disappears into the whole of the speakers presentation -- a very good thing. The rest of the frequency range was also coherent and uncolored. I couldnt detect any response anomalies. And, in fact, my in-room measurements toward the end of the review period showed a frequency-response "curve" that wasnt curved at all. It measured as flat as anything Ive had in my room -- quite a feat. Some big speakers might have the potential for big problems, but this one sure didnt sound as if it had any issues. But it did have ample strengths. The System M-S could move a lot of air when asked, and at any frequency. The pair of them could place multiple a cappella singers in the room with me, each occupying his or her own space. The Boyz II Men track "Yesterday," from II [CD, Motown 530323], sounded big and unforced, with good frequency transitions as the Boyz explored their vocal range. I heard no congestion that would make me think I was reaching the limit of the Ascendos output. They never sounded confused. The M-Ss exuberance continued into the midbass. Death Cab for Cuties "Title and Registration," from 2003s Transatlanticism [CD, Barsuk 32], was kept on pace by the Ascendo. This speaker didnt lack for punch, and could energize the Vault by moving boatloads of air as the music descended in frequency. Bass response was fairly deep and quite powerful right down to its lower limits (the mid-20Hz range in my room). And the M-S could flat-out rock when called on to do so. I threw some death metal its way and it threw the stuff right back at me at full intensity. Bring on Megadeath! Male and female vocalists were placed a tad farther back in the soundstage than youll hear with some of todays more popular speakers. Over time, I suspect this would be just fine, even if a listener doing a quick direct comparison might conclude that the M-S is more polite than reality. I liked the speakers overall neutrality, however. The sound was always honest, reflecting, as far as I could determine, what was on the discs I played. The lack of spotlighting at any given frequency might even lead some to describe the M-S as sounding a touch warm, and I wouldnt argue the point. A warm-sounding ribbon-based speaker? In this business, you never stop learning. If youve been reading Ultra Audio over the past year, youll know that a parade of terrific-sounding loudspeakers has passed through my system. Ive tried to choose speakers that I suspected had great potential, and though there have been some surprises in terms of how some of these speakers actually sounded in the Music Vault, there have been no outright disappointments. The Ascendo System M-S held its own against some other notable speakers, but it definitely had a sound all its own. 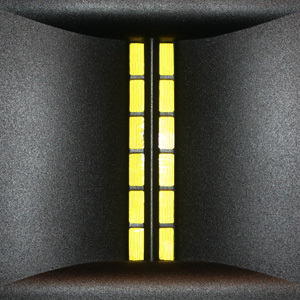 The YG Acoustics Kipod ($38,000/pair) is a far more precise-sounding speaker than the Ascendo System M-S. A pair of them image like laser beams, defining performers so precisely in space that the musicians physical outlines are virtually visible. The Ascendos cast a deeper, wider soundstage, within which images were presented with slightly softer focus. There was great texture to vocals through the Ascendos, and a palpable sense that the performers, particularly male singers, were right in the room. The YGA, however, held the advantage of a much sharper leading edge to brass and string instruments, which the System M-S countered with a more powerful, more energetic midbass. These two speakers are unlikely to appeal to the same listener -- theyre almost polar opposites. When I then compared the Ascendo M-S with the Wilson Audio Specialties WATT/Puppy 8, differences were still apparent, though not as pronounced as with the YGA Kipod. The Ascendos and Wilsons imaging and soundstaging were about equal: both setups produced deep, wide facsimiles of musical events. Both had effective midbass and adequate, if not subterranean, bass extension, and both were adept at giving the listener good resolution of fine detail. The Ascendos ribbon tweeter was able to present finer gradations of upper harmonics than the Wilsons dynamic driver, though the W/P8 had more solidity in the lower treble. Male vocals through the Ascendos were placed a little farther back in the soundstage; the W/P8 was more upfront. The differences between the speakers were not vast, however; your choice will be more a matter of personal taste. I can easily imagine the Ascendo appealing to the WATT/Puppy crowd. The Ascendo System M-S fits solidly in the überspeaker market. It has few limitations in absolute terms when compared with other expensive speakers; it plays loud without fuss and, Im confident, will fill very large rooms with big-time sound. It lacks true subwoofer-like bass, but then thats true of most speakers, even very expensive ones. The Ascendo System M-S is a nonfatiguing, basically full-range speaker system that will place the listener in a warm bed of realistic sound. Its unlikely that the owner of this speaker will be able to define specific weaknesses in its performance; instead, he or she will be drawn quite naturally into the music. The System M-S wont sound as big or as mighty as the flagship models of some other companies, and it wont be the precise instrument that elite field monitors can be, but that wont matter much to the person who chooses it. The System M-S is a great all-around music speaker that is made for the music lover, not those who care about sonic parlor tricks.